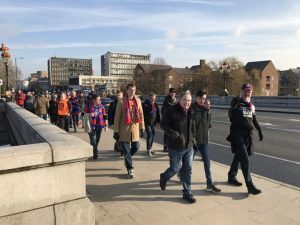 Following the success of this walk from Craven Cottage to Selhurst Park, fans of Crystal Palace and Arsenal have now linked up for a further event which will take place on the 21 st April for the Palace away game at the Emirates. 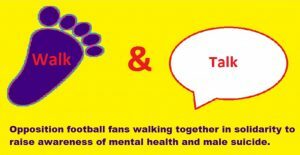 This will be another mental health and male suicide awareness walk from Selhurst Park up to the Emirates Stadium in North London. The fans will cover a distance of around 12 miles which will take about 4.5 to 5 hours (including stops). The overall aim is to encourage people to talk, to find help and to ultimately improve or save lives whilst trying to improve understanding and in turn break down the stigma. The walk itself is being undertaken as a direct result of personal experiences of many of the participants and, also because of horrendous statistics on mental health and male suicide. Mental health impacts 1 person in 4 but is much further reaching as, it can have an impact to friends and family of sufferers which can then create a tough and challenging environment in the home, at work or in social situations. This in turn then creates a cycle where stress and anxiety can actually grow and turn into a dangerous and desperate downward cycle. Male suicide covers 75% of all suicides in the UK and is the biggest killer of men under 45 years of age. It is estimated that roughly 12 men take their own life every single day which equates to around 84 a week and circa 4,500 a year which is a staggering and upsetting statistic. Men in particular are not good at expressing their feelings and opening up but, finding the courage to talk and find help is life changing and, in some cases can be life saving. The walk is the centre-piece to bring people together, it is aimed at demonstrating how powerful talking is and, as such is organised as a very social “walk and talk” event. The true vehicle to publicise the message and encourage people to talk is through the media, podcasts, web articles or social media as it can be spread easily and reach out to many people. Both Mental Health and Male Suicide have no colours and fans coming together prior to a game in unity is a truly positive message for the conditions described above but also football and football fans generally. Football itself is huge and powerful, it reaches every corner of the world and therefore billions of people. Many of these people will suffer with mental health issues, may have contemplated suicide themselves or will know somebody that has made the decision to take their own life. A lot of people interested in football and fans that attend games generally are men under 45. This profile alone, based on the statistics makes football a fantastic conduit to reach potentially vulnerable people. As such, the predominantly macho image of football and football fans themselves make the perfect target audience to try and make a difference. This tweet (@itvlondon) from ITN news below shows our recent walk from Craven Cottage to Selhurst Park and gives a view of the initiative, what we are trying to achieve and footage of the event. In the modern day and game, football is followed by people of all ages, across both sexes and spread across all cultures, countries and religions. It is therefore one of the most inclusive vehicles in the world.As such, getting the message out using football as the mechanism to encourage people to talk and seek help through football has huge potential. To get involved or to find out more, contact Paul (@HC15OnTour). 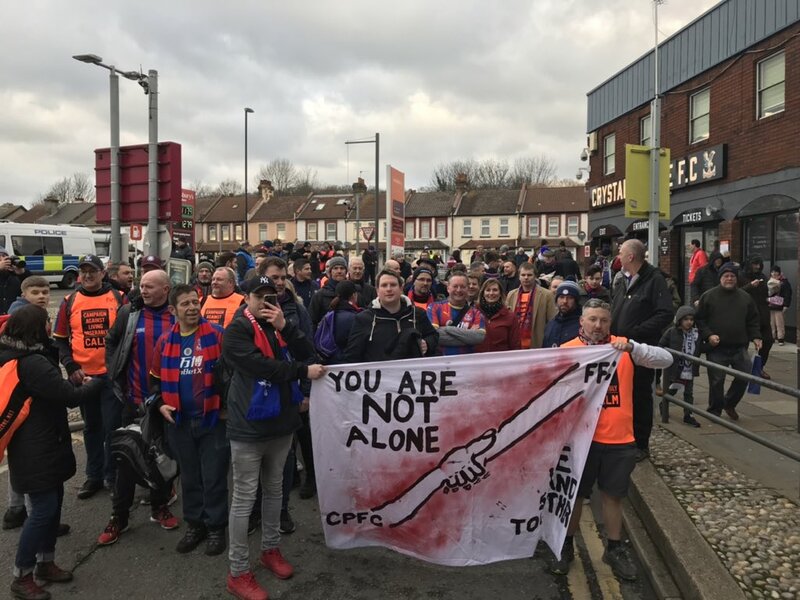 An article about the even and bigger picture was published in the week by Crystal Palace Football Club click here to see the page. 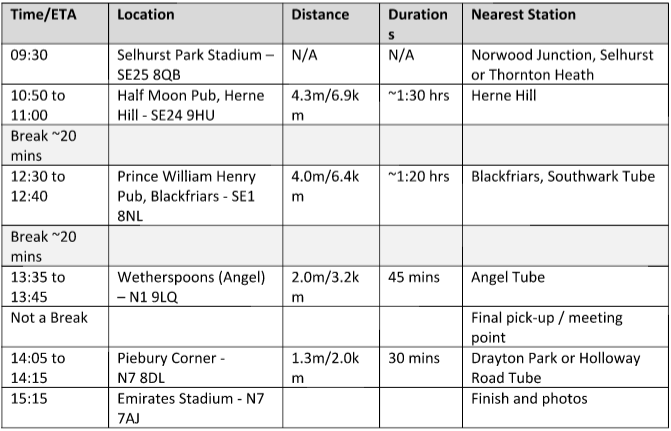 Proposed stops and the route are shown in the table below. 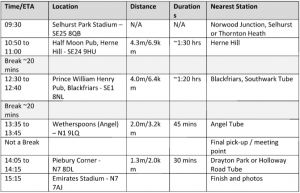 The route is designed so that people who don’t want to or cannot walk the entire distance can join or leave at any time on the route with timed stops along the way which are all in pubs next to train or tube stations for ease. The event will conclude outside the main entrance to the Emirates where both Palace and Arsenal fans will be supporting the making donations to the Arsenal Community Foodbank scheme. 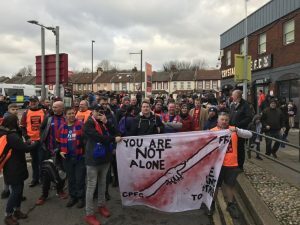 There is no registration and all people really need to do is be ready to leave Selhurst Park at 09:30 sharp in order to keep us on schedule. The event is incredibly inclusive and everybody and anybody is welcome to join or support along the way. The schedule below is indicative and provides forecast timings and stops. Click on the image below to make it bigger. 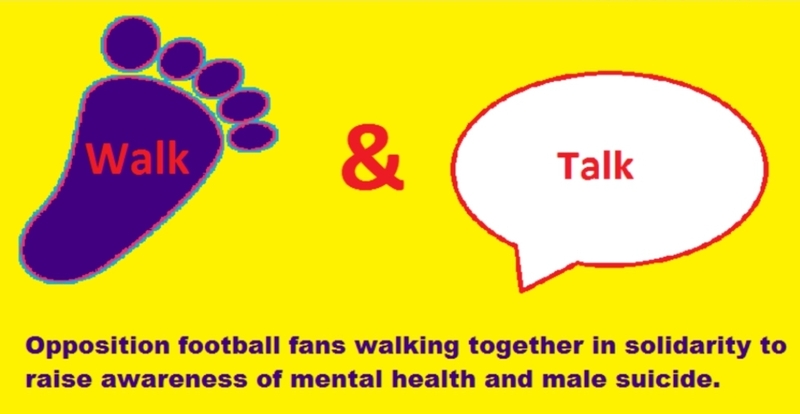 There are currently over 100 people that have confirmed that they wish to take part in this awareness walk which now also includes former Professional Footballer and Boxer Leon McKenzie who is very influential with regards to Mental Health. 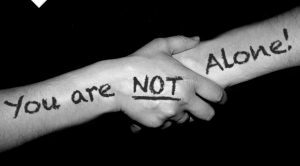 If you are in a bad place and feeling alone or desperate then, please do the right thing for yourself and your loved ones and talk to your family or friends. 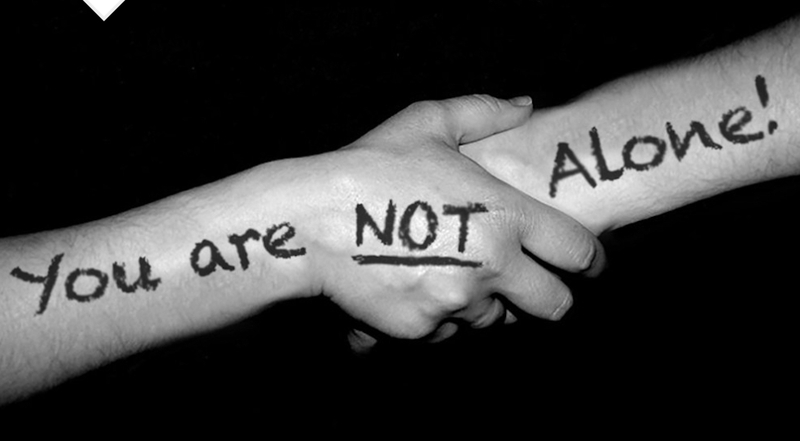 If you feel that you are unable to talk to family or friends, it is important to know that you are not alone and that help and support is out there from professional charities and help groups that are set-up and trained to help and advise people without fear, judgement or prejudice. People including complete strangers really do care about you and value you as a human being. Talking is the absolute key to finding a happier and more fulfilling life so, we encourage you to take that small jump and talk to somebody. It is a very brave and courageous thing to be able to open up to anybody but, taking this first step is absolutely huge and is truly life-changing and positive. Below are some important numbers that are available every day to support people so, please make that call.